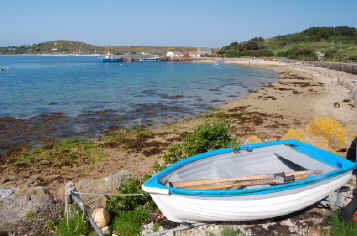 The Isles of Scilly consist of 140 small islands some thirty miles out from the Cornish coast in the Atlantic Ocean. Most of these islands are uninhabited except by sea birds and seals but you can stay on any of the five main islands, which offer a warm welcome to visitors. The main five islands are, St Mary's, Tresco, St Martin's, St Agnes and Bryher; around 2,200 people are resident within the Scilly Isles. St Mary's is the largest island at 2 miles by 2.5 miles and has the largest population at around 1600 people. Hugh Town is the main town on the island and is also where the boat from the mainland docks. 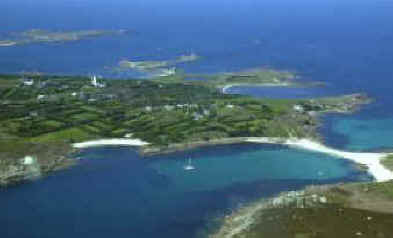 Tresco has around 180 residents and is followed by St Martin's with around 140; Bryher with 90, and St Agnes with 70. Most visitors to the islands stay on St Mary's as it has the most accommodation but it is also possible to stay on Tresco, St Martin's and Bryher which all have hotels. Only St Agnes has no hotel or visitor accommodation. The whole of the island group has been designated an Area of Outstanding Natural Beauty and the unspoilt natural environment is one of the main reasons that tourists visit the islands. All of the five main islands have white sand beaches but the best ones are on Tresco and St Martin's. The Isles of Scilly can be reached by air from Newquay, Penzance, Exeter and Bristol and by sea from Penzance on the Scillonian. There are boat trips from each of the main islands to the others on a daily basis. There are also trips to some of the uninhabited islands to see the sea birds and seals. Regrettably the helicopter service from Penzance to the islands finished in September 2012. As you can imagine the islands are a popular stop over for yachtsmen but if you are sailing in this area care is needed in navigating the local waters around the islands and this applies equally to windsurfers and divers; this is the Atlantic Ocean after all. Seek local advice before venturing out to sea. Boat Trips - Several companies on different islands offer trips around the islands for transport and sight seeing. Fishing - Several companies offer fishing trips including shark fishing. Cycling - Bikes can be hired at the time of writing on St Mary's and Tresco. Golf - the is a nine hole golf course on St Mary's.